Most organizations are unable to train their T & D staff in these areas, making those who possess this skill set very desirable in the job market. A quick search of Indeed using the term “E-Learning” in Chicago yielded over 300 jobs, most full-time. The Graduate Program in Training & Development at Roosevelt University addresses the critical skills barrier revealed in the research by preparing our students for careers in talent development, with a strong emphasis on E-Learning. From their very first course, students receive general knowledge of E-Learning tools and applications, fine-tuning this in our Training Technology course. Later, our students complete two courses in instructional design and an additional two courses in E-Learning where they use widely accepted design tools and software to create their delivery. When they graduate, many of our students work as instructional designers, virtual trainers, or consultants in E-Learning. Those who prefer a more general career path still benefit from their background in technology as it enables them to manage and lead others who perform these skills. In particular, for students who are seeking a career change to enter the field of training, the skills they develop in our E-Learning courses can make the transition to the new field faster and more lucrative. Although the field of training and development continues to evolve, one aspect that is critical to its future is technology and E-Learning. We believe that our curriculum, with its emphasis on technology, is contributing to the success of our graduates by developing critical and necessary skills for the next generation workforce. 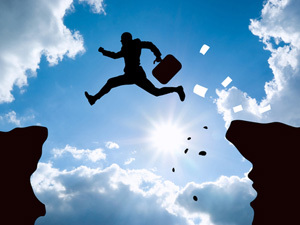 What are your thoughts on the E-learning skills gap? Do you see this in your organization? I have seen similar gaps in the previous organization I worked at. They used online modules to teach staff and they weren’t always the best learning experience. Some of the “learning modules” were PowerPoint presentations and lacked design and videos to facilitate learning. In short, it was basically a PowerPoint presentation for staff to read. The company lacked T&D professionals as well as the resources within the company to provide proper training to staff. The saying “Mind the Gap” is often used when conducting a root cause analysis to determine the actual problem at hand and the best solution that will ultimately lead to the desired outcome of results. There are huge gaps in the workplace in terms of the skills, knowledge, and know-how needed to support the design, development, and delivery to learners. The workplace environment has once again allowed the gaps of technology to widen further than their reach to successfully close them. The challenges that the workplace face today in terms of e-Learning platforms and their TD talent model to support it is no different than gaps companies experienced in the past in terms of hiring talent to implement a TD department to support classroom-led based learning. Organizations, in general tend to take the path of least resistance in terms of satisfying the minimum requirements of providing a level of training and development in the workplace. They do so without fully committing to the financial investment and resources to do it the right way in the first place. Or sometimes it’s merely a result of limited or no funds to support it. The catch twenty-two is leadership in organizations recognize the importance of training and developing their employees since the cost associated of not doing so far outweigh the training and development investment. The catch is it ultimately cost companies much more when not making the training and development investment due to employee turnover, client loss, and compliance infractions to name a few. When classroom-led training was “all the rage”, many companies cut corners by having their key employee lead the training, and yet future performance still was on the decline. Leadership learned that just because an employee excelled at their job, the ability to transfer their knowledge to new learners fell drastically short. Once companies made the investment of either hiring qualified TD practitioners, or used TD consultants as needed, did they see a vast change of performance improvement. Now, we are in the age of technology which is the catalyst for how people (in general) prefer to learn. The “need it now,” “how I want it,” “when I want it”, and “where I can get access to it” learning is the wave of the future, which is here to stay. Technology based learning platforms are outdated the minute it hits the market for general consumption because a newer, better, improved model is being launched. The supply of e-Learning platforms exceeds the demand of talent in today’s market to drive performance in the design, development, and delivery of information to the learner. While leadership may on the “buying bandwagon” to replace classroom-led training, with a form of e-Learning delivery (virtually-led, e-Learning self-paced modules), the people chosen to lead the TD process are once again, in most cases, are the same as those when classroom-led training programs were created. High level knowledge and talent on the subject matter with zero experience in training and development. The rate of employee failure rates will be as high if not higher than years past unless companies once again, hire inexperienced TD practitioners to design, develop, and manage the learning outcome and objectives for their employees. I’ve observed highly skilled individuals who were self-taught, or internally trained by other self-taught individuals with no formal training and development education. I’ve seen classroom-led IDPs and IGs converted into a virtually led training program without giving any thought as to how to deliver the materials for on-line training. I believe there are many opportunities ahead for TD practitioners with the formal education and knowledge learned during the MATD program. If I had a crystal ball, e-Learning will replace the majority if not all traditional classroom-led training programs. How are you going to help future employer’s or your client “Mind their Gaps” of e-Learning training and development in the workplace? Although it was disheartening to read that there is a significant gap in the expansion of E-Learning within many organizations, it provides me great optimism that I gained the skills, knowledge, and experience from the MATD program to offer my desirable abilities to potential employers. At my current place of employment, we do not have a Training and Development department and the organization does not offer or utilize any e-learning courses. I spoke to the Vice President of the company on my willingness to help build a training department and design, develop, and train employees through ILT and e-learning courses. Unfortunately, the Vice President declined and stated that perhaps in a couple of years as the company is still growing. We have approximately 200 employees and I have seen productivity and performance suffer due to the lack of effective training resources such as e-learning. I think that one thing has been left out! While some employees may have the ability or skill set to create e-learning with some training, many companies might also lack the time to give these employees the ability to successfully complete a robust e-learning program when they have none. With my current employer, they do not have anything at all and want to create e-learning for every aspect of the company. This can be extremely intimidating for any company with limited resources. I think more knowledge and resources for companies who do not have e-learning could help with awareness. This article is a positive reminder of the job market that awaits MATD students. As businesses look for cost effective and convenient ways to train employees with increasingly tight budgets, e-learning is logical solution. Hiring the right talent to create and support eLearning programs ultimately nets the company a positive return on investment because eLearning brings affordability and scalability to training programs, and it is a convenient delivery method with few barriers for participation and attendance. eLearning programs offer flexibility to attendees and ultimately tap into their own motivation to improve and advance within their jobs. As others have shared, this is not a trend but a new way of training and as such, graduates of program like Roosevelt’s MATD program are the cost-effective and efficient answer to businesses’ to talent and skill development in their organization. I learned that E-Learning is never going away. I think that one thing that educators need to keep in mind is engaging the audience with E-Learning. I have used a variety of e-learning tools and the biggest challenge I find is how the designer includes information, this skill cap shows the lack of diversity. I look forward to seeing how companies address this problem and most importantly how they will engage members in that training. I like the idea of e-learning becoming an industry all by itself. With the rapid change in technology, the needs of physical classrooms become less attractive. I go to school completely online, and I probably wouldn’t have the time to attend classes in a classroom based on my work schedule. It’s nice to see the job market is taking off for the developers and teachers as well. While I am delighted to learn that e-learning skills are in high demand, I was very surprised to learn that many companies are having difficulty offering e-learning due to lack of skills within their organizations. Given the experience I have gained in the MATD program I know that I have increased my value to my company, but have not observed any lack of e-learning experience in my work environment. In fact, quite the opposite is true. With a global work population in an extremely fast moving and competitive environment we must deliver training for the preponderance of our soft and hard skills via e learning. As well, my company encourages us to use cutting-edge tools and has specialists within our organization to continually evaluate the market to identify what can take our e-learning to the next level. I am very fortunate, and frankly, did not know the uniqueness of my environment! I have really enjoyed – and been challenged by – my MATD program from which I will graduate in December. I cannot help, however, to be re-energized by the fact that not only have I had the opportunity to apply the learning and skills in my current environment but that I gained a high-in-demand new skill that could present additional opportunities in the future. Thank you for opening my eyes to the high value of what our Roosevelt program has had to offer. In my experience, I have seen a similar gap. Many resources that were dedicated to training and development are generalists and e-learning design and delivery are considered specialized skills. When needed, there are resources contracted to design e-learning or update existing courses. I think it’s great that this article points out the demand for this specialized focus. Students can use this information to decide if they’d like to include e-learning in their specialized skill set, which may be attractive to lots of employers.